As dog parents, we all know that winter can be a not so fun time for dogs. While they love the snow, the rest of winter can be kinda boring, especially since there aren’t too many animals to chase and it’s pretty cold outside. Of course, it is up to us humans to make it as interesting as possible for our dogs by making sure they are safe, getting plenty of exercise, and of course, entertained. We all know that a bored dog can quickly become a mischievous dog. 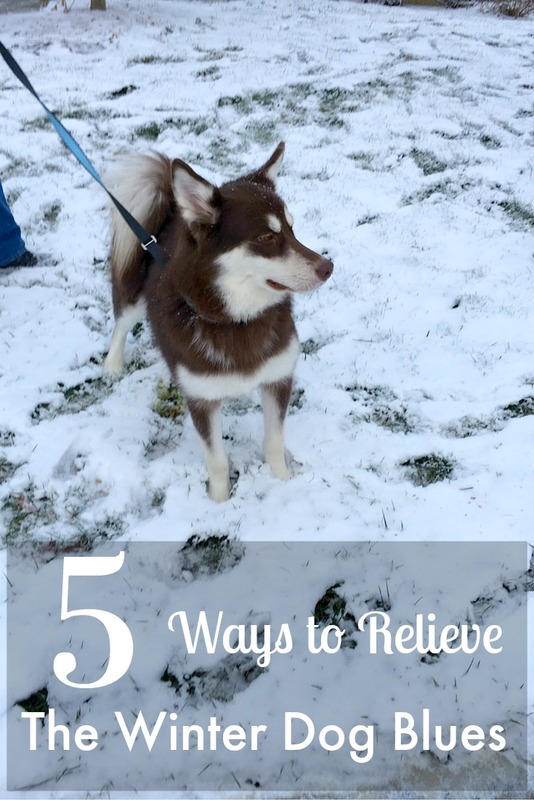 Luckily, there are things we can do to make winter more comfortable and fun for our favorite dogs! Okay pet parents, ‘fess up. How many of you are making potty time outdoors as quick as possible due to the cold temperatures? None of us want to be going for long, less-than-happy runs in single degree temperatures, and we know it isn’t really safe for our dogs either. Our dogs, however, still need a way to let out all of their pent up energy and something to get their mind thinking. To keep them busy, considering having indoor-safe toys that encourage activity, especially if you have more than one dog. 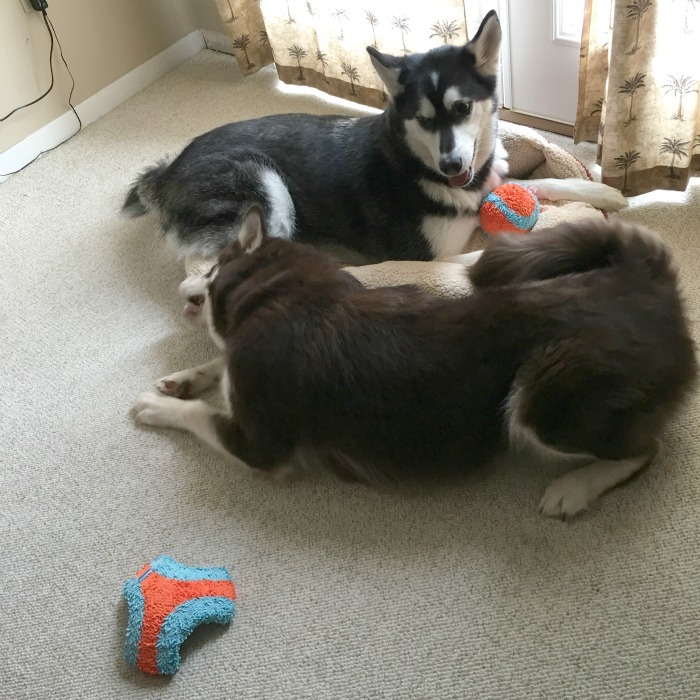 Ivi and Reya love the ChuckIt Indoor Ball and Flyer toys since it allows them to play fetch indoors without doing damage to anything in my house (they are lightweight and a bit more padded than other toys). Between these toys and interactive puzzle toys, we keep the girls entertained, happy, and excited about playtime inside. If your house is anything like ours, the girls roam the house freely and know they can go just about anywhere in their domain. Most guests are used to working around the girls, and we don’t really restrict them too much with guests. Just like the holidays, however, sometimes they need to have somewhere where they can recoup and hide if they don’t feel like dealing with loud noises or the humans are stressing them out. For example, while we aren’t sports fans, we have guests that will be yelling at their phones or TV if sports are on, making them easily nervous or upset. To make things easier for them, we always give the girls access to our office, which includes their crates (which are open with crate covers to feel like caves), antlers, and some of their favorite toys. Guests aren’t allowed in this area, guaranteeing that they have a quiet, happy, and comfortable place to relax where they can de-stress and decide for themselves when or if they want to be out and about while others are visiting. For dogs, one of the worst parts of winter is that it gets darker much earlier. This means that by the time their owners are off work, it is dark, gloomy, and their humans don’t want to run like crazy in the dark. Rather than forgo time outdoors (other than potty time) consider going with glow in the dark items, such a glow in the dark or light up collar to make it easier for you to see your dog and motorists who may not easily see your dog while driving. As well, glow in the dark toys are just as fun for keeping your dog and you entertained during your limited time outdoors. Reya and Ivi especially love playing with their JW Megalast Glow Toys and ChuckIt Glow Toys (you can see Reya playing with one in the video below). With the weather being very sporadic, it is important that we keep things as safe as possible. One of the ways we do this is making sure that we always have pet-safe salt available and all the winter items that aren’t pet safe are well out of their reach. Unfortunately, this isn’t always the case with our neighbors and stores we may be visiting. They are very quick to put out the cheapest (or most effective) salts they can find. While they may be great at melting ice, it is also fantastic at burning sensitive paw pads or other exposed skin, leading to a very nasty vet bill. As well, many dogs love to to eat or nuzzle snow, which led to Reya accidentally burning the top of her nose last January with harsh salt and snow – the damage was done before we could even get inside to wash it all off while traveling. To protect your dogs, make sure they are wearing booties and try keeping them in fresh snow as much as possible. As well, keep wipes and fresh water on you at all times to make sure you can wash off anything harmful as quickly as possible. One of the biggest myths out there is that dogs don’t really get cold since they have a built in winter coat. Dogs are just as sensitive to bitter cold winds, icy temperatures, and of course, wet snow that feels miserable if it is too cold. While dogs may have fun, it is just as easy for them to get sick, especially if they are having issues getting warm again. After drying them off indoors, consider having a warm blanket and bed where they can relax and warm up again. Personally, I love the Shearling Dig and Burrow line of beds since they have heat-reflecting Mylar technology that helps warm dogs up quickly without electricity, by trapping and reflecting their own body heat. With the right amount of preparation, it is easy to keep your furry family safe and comfortable during the winter indoors and out. Who knew winter could be so much everyone for everyone!? You have beautiful dogs! We throw balls in the snow or a frisbee when it’s cold for a few minutes. These are really great ideas for the doggies in my life. Winter time is hard on us humans, but we don’t always realize how it is the same for the pups. Thanks! Those are great suggestions for winter time with dogs. i love seeing our dogs in posts. Thanks for the post and i will have to do these winter blues activities. To me it looks like not for long the dogs will be in winter blues. Oooh I like warm comfy places and quiet too 😉 Too bad with a 3 year old I don’t get much of that lol!! My sister takes her Springer spaniel (energy on legs) to a play group for dogs a couple of mornings a week. It gives her a chance to get errands done & Lolly thoroughly enjoys herself! I never knew that dogs could get the blues during the winter months. I guess if humans can depressed during these months that dogs can as well. It’s more difficult with larger dogs. My little ones run all over the house. So many good ideas for puppies in the long days of winter. I think the reflective color are so good for those walks in the dark. Great article.Wonderful ideas to help beat the blues.Thanks for sharing. It certainly would make sense that dogs would get the blues when it’s too cold for them to be outside safely for long. These are great ideas, thanks for posting! I really like the one about the dog beds. My dog is so obsessed with his bed. I bought one from a different store to replace his and he would not lay in it. 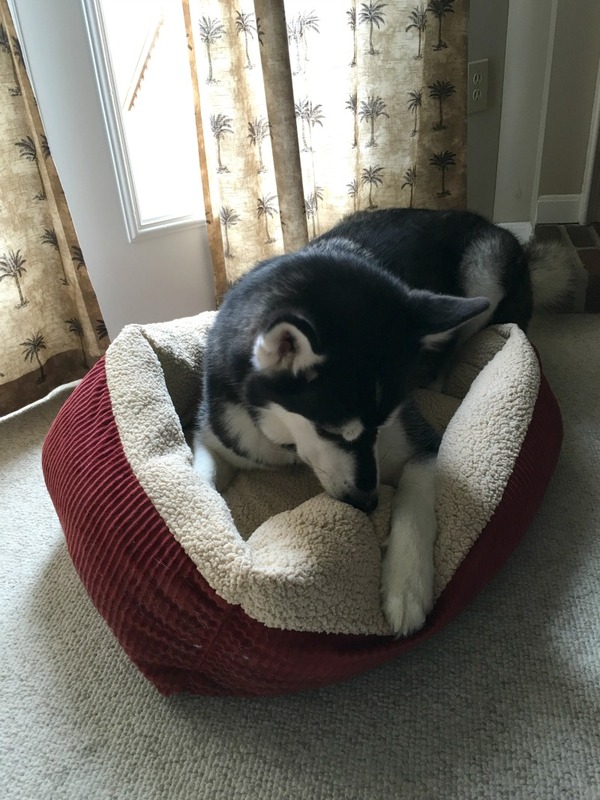 I had to give it to the other dog and go to Walmart and buy his regular bed. They are SO cute! I am thinking my dog Kallie is getting antsy during winter but the cold is not bothering her. I have a large fenced in yard and she still manages to squeeze out of the gate and get out just to run. I like the idea of interactive indoor play. Maybe that will help her. Great suggestions, Thanks for sharing..My dogs love the outdoors and will stay out if they could til they become frozen snow dogs..So I am always trying to find things to keep them entertained while they are inside. Your Dog’s are so cute! I have never thought about Salt in the Snow, since it doesn’t really Snow around here, glad that you let Me know though in case we visit Colder Climates. Thanks for the Post, Pictures, and the Information! What a cute dog. My dog likes to do puzzles when it is cold outside. She also likes playing in the snow so she gets her exercise all year round.